Chef AJ calls me the Batch Cooking Queen! That is because I batch cook and batch prep salads weekly. Batch cooking is simply cooking or preparing more food than you can need for one day. This is one of the healthy habits I have developed that I feel helps me sustain a whole food plant based lifestyle. Batch cooking saves me time overall, ensures we will eat healthy and results in less food going to waste. 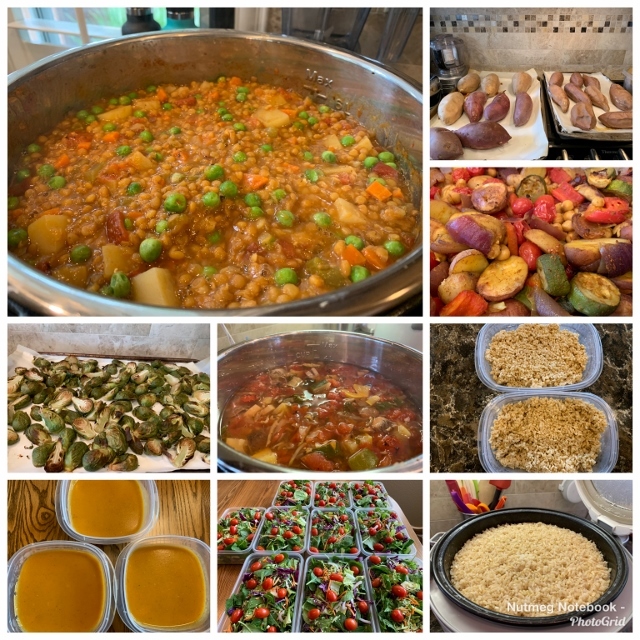 Here is how my recent weekend Batch Cooking session went. I hope you enjoy seeing what I made. It looks a little different each week and it changes when the seasons change too. Some of what I cook will go in the freezer as we also keep a pretty good stash of home cooked food frozen for easy fast meals. You never know what life is going to throw your way but we are always well prepared food wise! We have all of this scrumptious food to nourish our bodies this week! I always start by baking potatoes. These are in the sink ready to be washed. 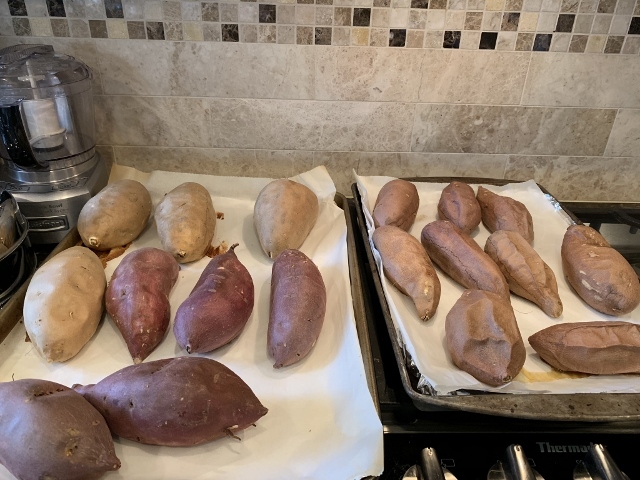 They will be baked in a preheated 400 degree oven 1 hour for Yukon Gold and about 1 hour 20 minutes for the various sweet potatoes. I line my baking sheets with parchment paper for ease of clean up. Not shown are the Yukon Gold potatoes. 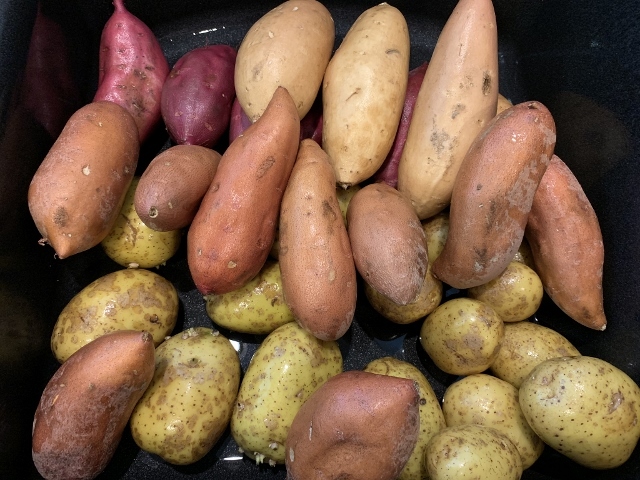 I pierce the Yukon Gold potatoes prior to baking but not the sweet potatoes. These are Oat Groats that I cooked in the Instant Pot. So easy and they come out like brown rice. I use them in place of brown rice – they have the ability to help lower LDL cholesterol. They taste fabulous. See my Oat Groat Video and Blog Post to find out how to make these! I actually made these Saturday morning to get a head start on batch prep for the week. 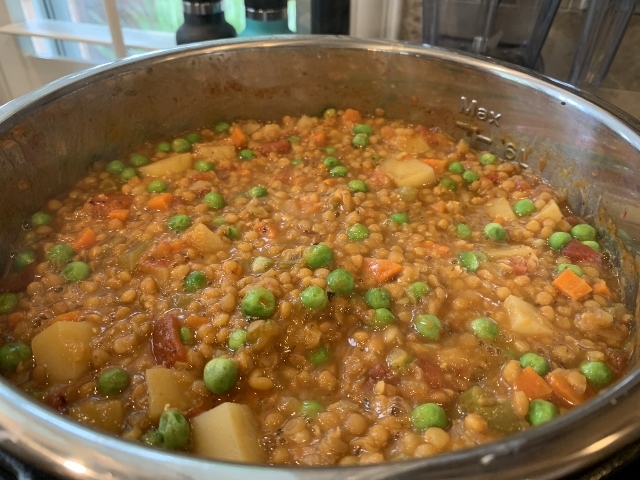 On Saturday I made this scrumptious Hearty Lentil Vegetable Stew in my 8 QT Instant Pot. The large capacity of the 8 QT allows me to make very large batches of soup, stew, chili, corn on the cob and 4 artichokes at the same time. 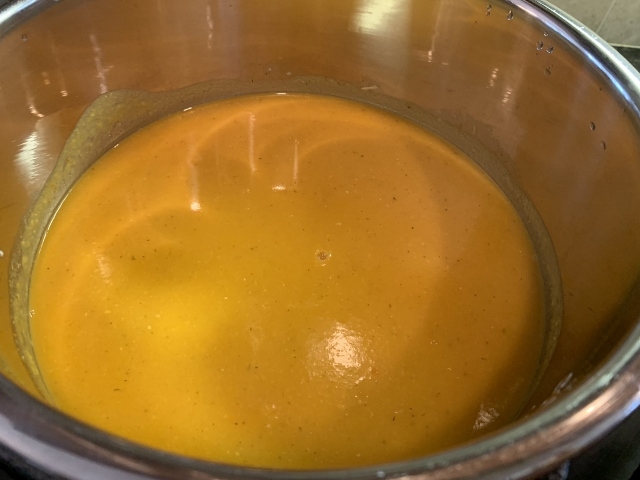 In the 6 QT Instant Pot Smoky Butternut Bisque from Chef AJ’s The Secrets To Ultimate Weight Loss book. Page 199 in her book – so creamy and delicious. It’s wonderful served with a scoop of wild rice mixed in. You can serve it hot in mugs as an appetizer when you have company. Sprinkle a few chives over the top to make it look extra special. When the Bisque was done I used the IP to make Chef AJ’s Garlic Lovers Soup from one of her recent Weight Loss Wednesday Videos. I didn’t have Cruciferous Crunch so I used 10 ounces of the Sweet Kale Salad from Costco – it’s organic which I prefer. This soup is all veggies and mushrooms. The nice thing about is you can add starch of your choice when you reheat it for a meal. You can season it to your liking as well – use an Italian seasoning mix or a Mexican one or Herbs de Provence are a few that I like. This was a 2 pound bag of organic Brussels Sprouts from Costco. 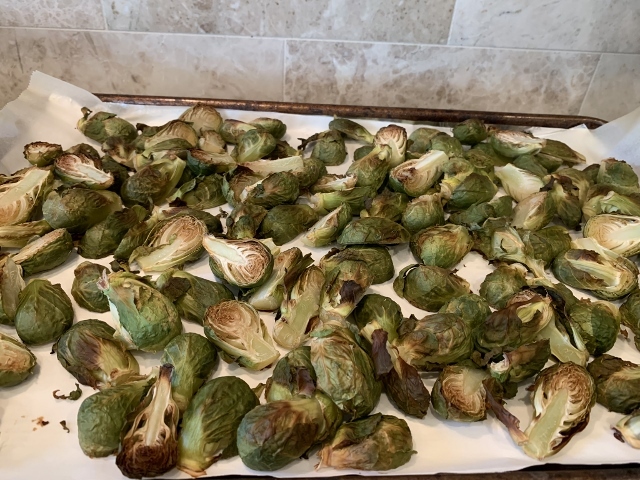 I cut them in half – placed on a parchment lined baking sheet and roasted in the oven after the potatoes were done in a preheated 400 degree oven for 40 minutes no oil. You can also No Oil Air Fry them but I like them just as well in the oven. No seasoning on them – we like them plain. These get added to salads, eaten as snacks or become part of a Nourish Bowl. Tom is in charge of making rice around here. He makes a batch full in our Aroma Rice Cooker. 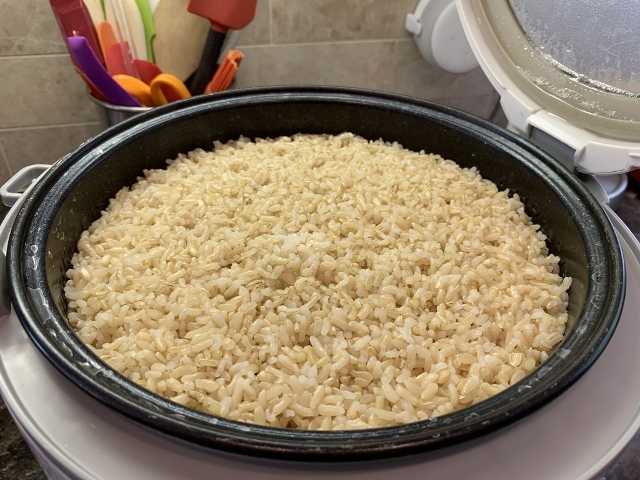 We like how it turns out in the rice cooker better than when we cook it in the Instant Pot. Personal preference I guess. 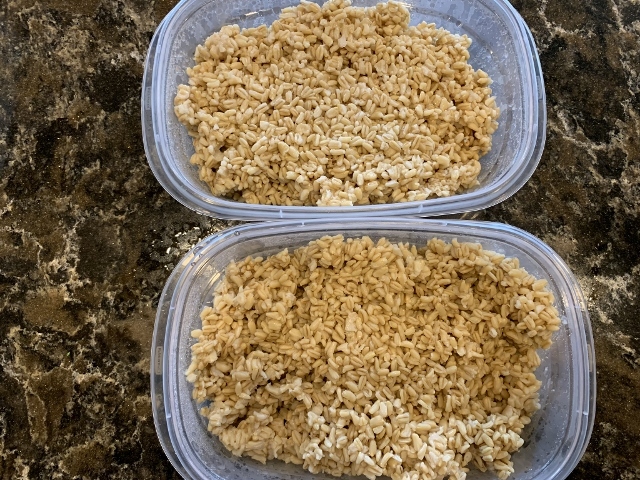 We divide the cooked rice into 4 cup containers for the freezer and then one larger container to keep in the fridge for the week. I don’t eat a lot of rice but Tom loves it! We buy Lundberg Organic Short Grain Brown Rice that is grown in California. The only way I can eat a salad everyday for lunch is if I prep them on Sunday for the week ahead. here I am getting ready to top them each with the organic tomatoes from Costco. 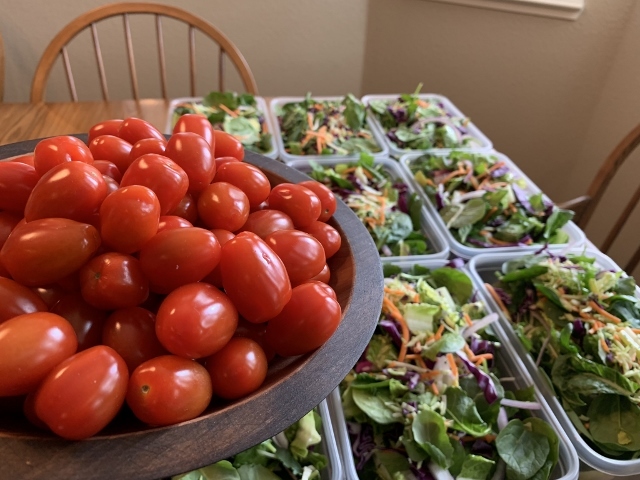 I batch prepped 10 salads so we can each have a big beautiful salad through Friday. We chop them and turn them into amazing Big Beautiful Chopped Salads the day we are going to eat them. The link above takes you to our blog post and video to show you how to make them. Chopped salads are a game changer for most people. I get emails from people all the time telling me that they love chopped salads. You have to try them to see what all the fuss is about! I have been having a salad just about everyday for lunch since going whole food plant based in 2013. It helped me lose weight and it helps me maintain my weight. It is highly nutritious and low calorie density – you can make them taste different everyday by what you add. I love my salads! Also it’s a no brainer I don’t have to figure out what to eat for lunch everyday – I know it’s going to be a salad. Done! 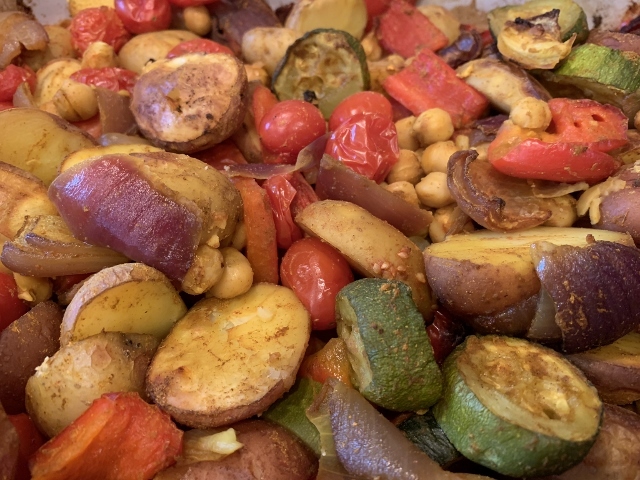 This was a one dish veggie, potato garbanzo bean oven roasted dish I am experimenting with for a an upcoming project. Stay tuned. It turned out delicious. Tom had it for lunch and I had it for dinner. Yum! Here is the final collection of Batch Cooking for this session. Some of it will go in the freezer for future meals. The rest will go in the fridge and we will heat and eat it all through the week. I have more blog posts on Batch Cooking that you might enjoy. To find it in the future click on the Recipe tab at the top of the page and then click on Batch Cooking under the cooking method category. Do you batch cook? If so, please leave a comment and let me know if you batch cook all in one day or do you spread it out over 2 or more days. 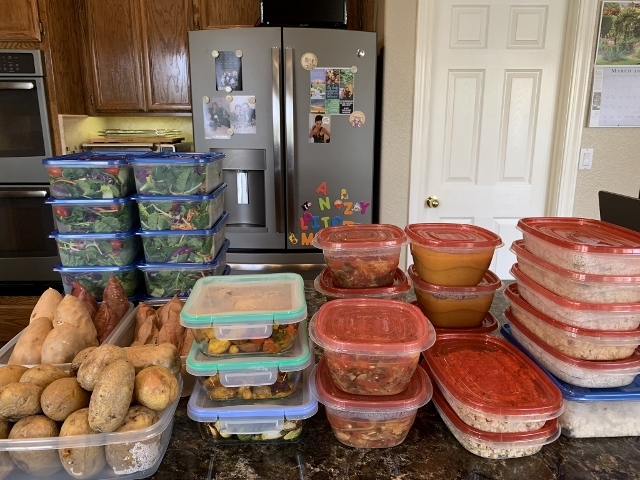 There are so many ways to batch prep food – it helps others see how we all make this work so please share what works for you. When you use our affiliate links you help support our work here without any extra cost to you. Thank you for your support. Here is a link to our Amazon Affiliate Page where you can see our favorite products. Great looking menu for the week! Such a helpful blog post! Thanks for sharing. Since you asked for comments, I spread out the batch cooking throughout the week. I make the following on Sunday – 1) a big pot of soup because my husband and I eat soup for lunch every day during the week, 2) a batch of hummus from home-cooked garbanzos to eat with raw veggies at lunch, 3) chai tea (recipe from Dr. Greger’s How Not to Die Cookbook), 4) a batch of date paste to top my morning oatmeal, and 5) two kinds of salad dressing to last the week for our huge dinner salads, The day after my shopping day, I chop several bunches each of green onions and radishes and roast mushrooms tossed with balsamic vinegar for topping our salads. Other salad items I buy pre-chopped like cabbage slaw or the cruciferous crunch. As needed but no specific day, I grow broccoli sprouts for salads, make carrot pulp crackers in a dehydrator (the pulp is from carrot juice used as a soup base), and make soymilk in a soymilk machine. 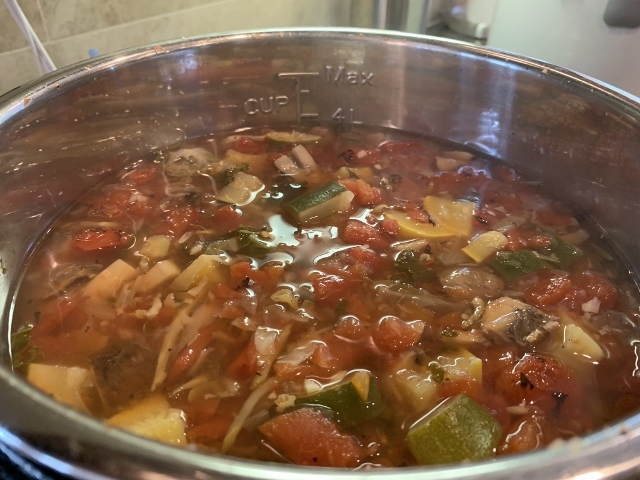 So while our evening main dishes are not batch-cooked as we share dinners with my daughter’s family of 5, batch cooking sure helps keep healthy foods available. Any amount of planning ahead is helpful! Thanks again for your helpful posts! Thank you for sharing how you batch cook. I think it’s good for others to see that there are many different ways to batch cook. Everything you make sounds wonderful. How lovely that you can share dinner with your daughter’s family. Thank you so much for taking the time to share your batch cooking methods. Tami, you are truly my inspiration. Thanks to your posts and videos, I am doing more and more batch prepping and cooking. It really makes things so much easier. I know we would not be eating so much salad if I had to stop and make the salad every day. So helpful! I am so impressed with you and your batch cooking. Can you recommend a starting point? I feel overwhelmed trying to plan what to batch and amounts. I have been vegetarian for 8 years and want to take the wfpb approach. I read so much but never take the final step. Your batch cooking idea will help. Any advice for newbies? Thanks so much! It all depends on your eating style and what you eat each day. I don’t eat breakfast – just lunch and dinner. My lunch is always a big chopped salad. 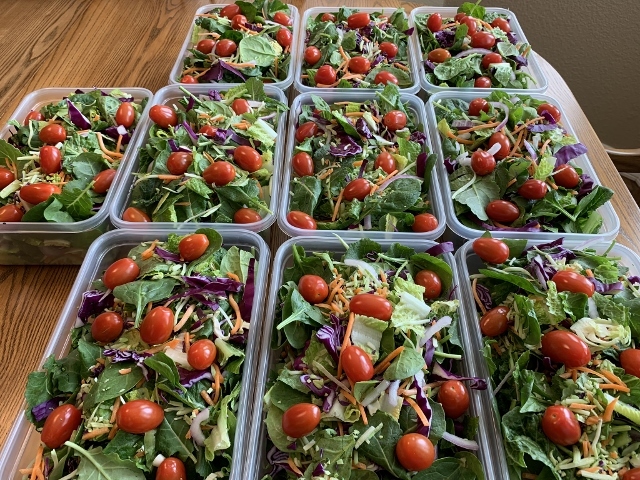 So first off I make enough salads for my husband and I to get through the week days. We always eat starch each day so we make enough starch to last for 7 days that includes oat groats,winter squash, rice or quinoa. Our dinner is usually starch and a soup, chili, stew or veggie burger. I would make a list of what you typically eat in a day and batch cook enough of that to last 5-7 days. What that looks like is going to be different for each family depending on what you like to eat and how much you eat. I also make double batches of food so I can freeze some for future meals and we rotate those things into our week as well. Just think about making more than you can eat in one meal or one day. Some people spread their batch cooking out over 2-3 days. One day they make salads. One day they make starch and soup. One day they make salsa, cheeze sauce or salad dressing. See how easy that is? Thank you so much for your help! I’ll look through your posts in the meantime. This is an excellent blog post! Very thorough, clear and well written. I just want to say that if your career wasn’t in education, you missed your calling. What healthy fats do you add to your salads to increase nutrient absorption? How often do your eat berries? Thank you for the recipes, tips and techniques. Thank you for your kind remarks – I always appreciate feedback. I don’t add any “fats” to my salads – I adhere to a low fat plant based diet and although some of the plant based doctors promote eating some fat with your salads others do not. With the large quantities of dark leafy greens I eat I really don’t worry about nutrient absorption. Dr McDougall says the fat you eat is the fat you wear! That has been so true for me. To add fat or not to add fat is a personal choice and as individuals with different body chemistry and medical history we all have to decide what is best for us. I myself have issues with my body producing too much LDL cholesterol and I have to be careful with having fats yes even healthy fats in my diet. I also have hypothyroidism and gain weight easily and adding fats even those healthy ones adds unwanted weight. I love the healthy high fat plant foods and if I could eat them without any negative side effects I surely would. I eat berries often but how often depends on the availability of organic berries. When I can get fresh organic berries I eat them every day but there are times that the cost is out of my reach or they are not available. Since I don’t eat smoothies and I don’t have hot oatmeal very often I haven’t figured out a good way to incorporate frozen berries into my diet. I know Dr.Fuhrman has his GBOMBS daily and Dr Greger has his daily dozen but, I just don’t get too hung up on those daily must haves. I eat low calorie density foods that are high in nutrients and eat a wide variety of fruits, vegetables and starches daily. I stay away from highly processed foods, I don’t add salt to the foods I prepare and I am oil, sugar, flour, alcohol, gluten and caffeine free! This has been working well for me since I adopted a whole food plant based lifestyle in 2013. As I have learned more about this lifestyle and nutrition I have tweaked what I eat and I am pretty happy with how things are going and how my lipid panel looks these days. Although those of us in the whole food plant based lifestyle may vary slightly in how and what we eat we all do agree that this plant based lifestyle is the best all around for our health, the environment and of course the animals. I really enjoy all your posts, Tami! Thank you for sharing. Just wanted to ask you, is all this food for you and your husband only, or do you share with your daughter and her family? I aim to eat like you and I”m just wondering how many potatoes I should put into the oven, as I begin my batch cooking. I do share food with our adult son as well as our daughter and her family. How many potatoes you put in the oven would depend on how many your family eats in a day. They last for a week in the fridge. So think about how many you will be eating each day and go with that number. Love your blog. Great idea on the salad prep. What size containers do you use to put the salads together and did you get them online? Thank you – I am so glad you like blog and the salad prep. They are the 9 cup Ziplock containers. They are sold at Target, Walmart and Amazon.